APRS 5th Class admissions counselling dates/apreis 5th class admissions certificates verification dates/list documents/call letters/Shortlisted Candidates for 1st phase Counseling: APREIS issued APRS 5th Class Entrance exam 2017 Notification in February 2016 for admissions into fifth class in AP Residential Schools for the academic year 2017-18 and APREIS officials invited online applications from the Class IV bonafide students from 05-01-2017 to 06-02-2017 for admission into V class in its APR Schools and this admission test was conducted at all district head quarters on 05-03-2017 by 11 AM to 1 PM. These results were released in this week and results are now available its web portal. The students who were appeared for AP Residential Schools Admission Test 2017, they were checked their results @ http://aprs.cgg.gov.in/. Now, Officials have announced the APRS Admissions Counselling dates for admission into 5th class in APR Schools. 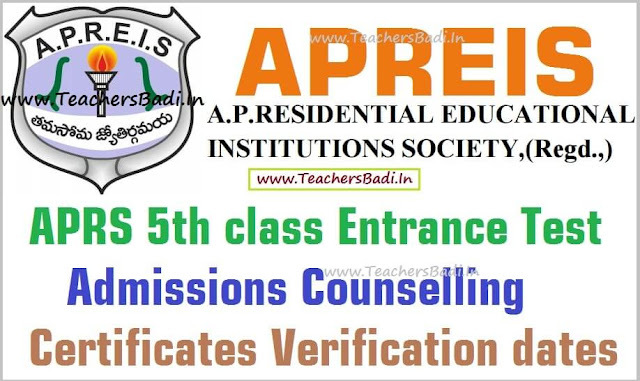 Certificates verification and Selection of Students for admissions into Class V in all A.P.Residential Schools for the year 2017-18: APREI Society has conducted Admission test on 05.03.2017 for admission of students into class V in all A.P. Residential Schools for the academic year 2017-18. Selection lists are prepared for each school based on the merit in the test, rule of reservation and the options exercised by the student in the application form duly following the other conditions like rural study etc. Results are declared and placed on the website at aprs.cgg.gov.in and apresidential.cgg.gov.in for the information of the candidates. All the parents of the selected candidates has informed through SMS to download the result sheet by them and to attend for the verification of certificates at the District Convenor School on --/--/2017 at 9.00 AM as the students have applied through online without any certificates. They were informed to attend the Convenor schools along with original certificates regarding Caste, special category (PHC/Orphan/Children of defence personnel), Income certificate, study certificate etc. They were also informed that they need not bring the candidate for verification of certificates and need not bring transfer certificate. After satisfactory verification only, the candidate’s selection should be confirmed and the parent should be informed to attend the selected school on 15.06.2016 along with student and transfer certificate for admission. Selection lists pertaining to all the Schools to which the students of that district are eligible are made available on the website to download before the verification of certificates. While selecting candidates, If candidates under Orphan/PHC/CAP quota are not available in the merit list such seats are converted into open category, if BC-C candidates are not available, that seat is allotted to BC-D and similarly BCE to BC-A. 1. Certificates are to be verified by the convenor with the assistance of all the Principals of that District at the Convenor School on 06.06.2016.
a) Candidate has to produce the certificate under the category in which his/her selection was made. For example, if a candidate selected under BC-A category he has to submit the relevant certificate. If a candidate selected under special category like PHC / CAP / Orphan then the certificate of that category should be produced. b) If a candidate is selected under open category there is no need of caste certificate. c) If a candidate is selected under CAP category there is no need of income certificate. d) Except CAP category, all the candidates have to submit the parental income certificate with annual income not exceeding Rs.60000/-. f) The selected candidates must have studied class IV during 2015-16 academic year in Govt/Govt Recognised schools. g) Candidate must have studied continuously 02 academic years in that District. If a student studied in different districts for 02 years, the study district for the year 2015-16 should be considered. h) The candidate must be born between 01-09-2005 and 31.08.2007.In case of SC/ST candidates they must be born between 01-09-2003 and 31.08.2007.
i) T.C. need not be verified. Once the selection is confirmed, the candidate may be informed to attend the allotted school along with T.C/Record Sheet duly counter signed by the concerned MEOs. j) If any candidate fails to produce the concerned certificates, then the selection of such candidate shall be summarily cancelled. k) If a candidate is selected for the school of 1st preference mentioned in the application form, there would be no change in allotment of school. If a candidate is allotted to the school which is other than 1st preference, then there would be an option for sliding in the next list. l) District Convenor should inform the candidate about the sliding option and if a candidate willing for sliding in the subsequent lists, same should be mentioned in the vacancy report. m) After completion of verification on --/--/2017, District Convenors should send a letter through Registered post to the Shortlisted candidate who is not reported for certificate verification on --/--/2017 giving time upto --/--/2017 for certificate verification. District Convenors may permit the shortlisted candidates for submission of certificates before --/--/2017 if they report on --/--/2017 and unable to submit any certificate on that day and requested for time. n) The Dist.Convenor Principals should send the list of candidates short listed for admission both reported candidates as well as not reported candidates along with their Contact Nos.in the enclosed format in Excel without fail immediately on --/--/2017. o) The non joining report along with the candidate willing for sliding (those who have selected to the school which is not the preference-1, should be submitted to this office on 06.06.2016 without fail. p) The District Convenors should make necessary arrangements for verification of certificates on 06.06.2016 duly following the above guidelines.